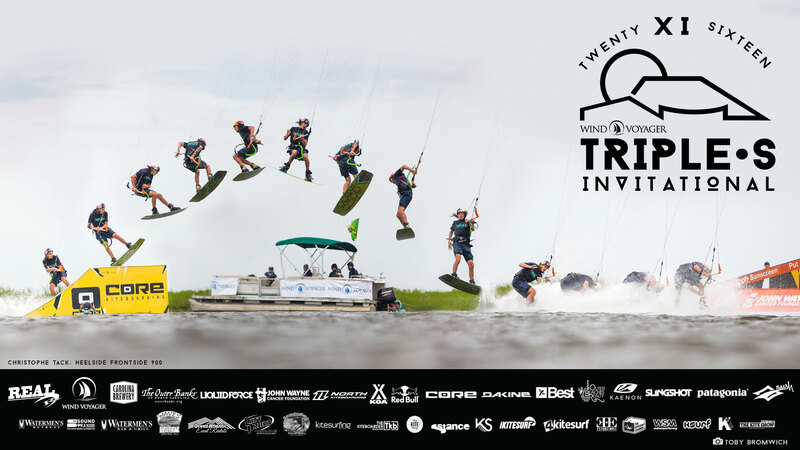 Kiteboarding history was made yesterday at the Wind Voyager Triple-S Invitational in Cape Hatteras, North Carolina. This event features the top 32 professional kiteboarders in the world, competing in the REAL Slider Park for $50,000 in prize money. New to the 11 year running of the event, is this year’s Wind Voyager Triple-S Challenge Series, paying out $720, $900 and $1080 to the first female rider landing a 720, and the first rider landing a 900 and 1080 off of a kicker in a competition heat. On Monday, June 6th, Wind Voyager Triple-S competitor Christophe Tack rose to the challenge and stomped not only one, but two consecutive heelside frontside 900’s off of the Core Super Kicker in the Men’s Final Heat. This heat was run in The Slick, located directly behind REAL Watersports, in SW winds ranging from 22-25 mph. The clean execution and landing of these 900’s were witnessed by a roaring crowd of spectators, event staff and live stream viewers on Facebook. Christophe Tack is a 23 years old professional kiteboarder from Belgium. His sponsors are Liquid Force, Red Bull, Mystic and Bomber. Christophe is a 5-time Belgian National Champion and 2014 PKRA World Freestyle Champion. Final results for both Men’s and Women’s divisions will be released at the Wind Voyager Triple-S Awards Party, Friday, June 10th. Live entertainment at this party includes Dub Island Sound System and the Dubplates with special guest Tanya Stephens. This party is open to the public and legendary in reputation. The 720 and 1080 still remain on the table for the remainder of the event which ends Friday, June 10th. If these go unclaimed, the money will roll into the 2017 Wind Voyager Triple-S, which means $1440 for the women’s 720 and $2,160 for the 1080. “Christophe Tack is such a driven and motivated competitor. As soon as we laid out the plan for the Wind Voyager Challenge Series to the Triple-S Invitational competitors, I knew he had his sights set on it. It was so rad to be front and center on the top of the John Wayne A-Frame rail doing the live feed, for not just one, but BOTH of the 900’s that Tack landed! One for the Wind Voyager Triple-S history books for sure! !” – Jason Slezak / Wind Voyager Triple-S Co-Founder and Co-Director. “It wasn’t a question of if the 900 was going to happen at this years Wind Voyager Triple S invitational, more which rider would get to the prize first. Wind Voyager Triple-S Challenge Series video featuring Christophe Tack’s groundbreaking 900 filmed and edited by Wind Voyager Triple-S videographers Brian Wennersten, Jeffrey O’Neill and Ryan Osmond.